Dawn Nowacki, Professor of Political Science, reading The Dark Side: The Inside Story of How the War on Terror Turned into a War on American Ideals, by Jane Mayer. 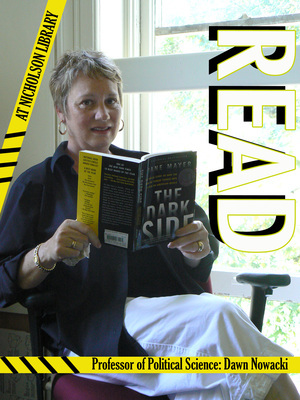 Terry, Paula and Nicholson Library Staff, "Dawn Nowacki READ Poster" (2009). READ Poster Gallery. Image. Submission 58.